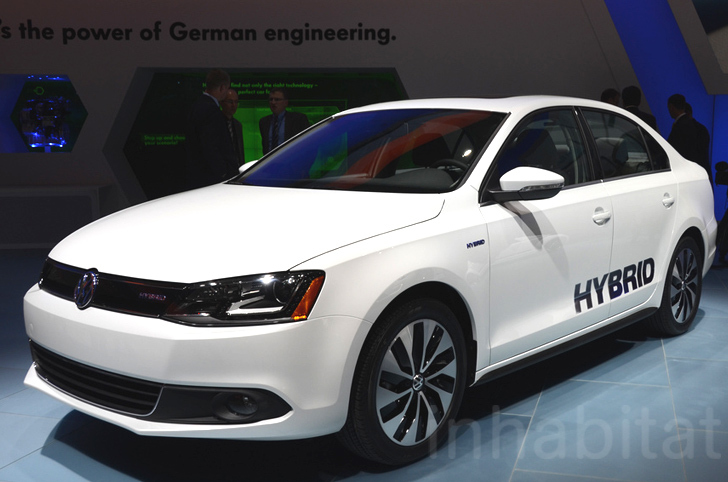 The excitement keeps rolling along here at the 2012 Detroit Auto Show, where the latest green car to capture our attention is Volkswagen's brand new Jetta Hybrid sedan. Based on VW's extremely popular Jetta design, this little beauty is already sparking talk that it could bump the Toyota Prius out of the top hybrid spot in U.S. markets. With a modern update to the car we know and love, the Hybrid Jetta may quickly become the ideal, multipurpose sedan. Read on to see all of our exclusive photos of the unveiling. Volkswagen really stepped up their green game at the 2012 NAIAS as this new Jetta makes them one of the very few automakers that offers both clean-diesel and hybrid versions of the same vehicle. The car has a 1.1 kilowatt lithium ion battery mounted in the trunk while a 20 kilowatt (that’s 27 horsepower) electric motor sits sandwiched between a 1.4 liter turbocharged gasoline engine and a seven speed manual transmission. With a front-wheel drive, seven-speed dual-clutch automatic transmission, the hybrid Jetta will have an estimated combined gas-mileage rating of 45 mpg, according to Volkswagen. Outside, the car’s been outfitted with an updated grille and a rear spoiler that boosts its aerodynamics. Inside, the Jetta comes equipped with an instrument panel that relays hybrid system information and a “zero emissions” menu in the stereo that shows what percentage of the last minute was spent without using engine emissions. Coming to showrooms around the country this fall, the Hybrid Jetta may be one of the hottest eco and pocket friendly electric vehicles this year! Why is VW so dumb?? Don't use a 1.4 liter OTTO cycle gas engine! I don't think they are even using an Atkinson cycle OTTO. VW is not very good with gas engines, take the whopping 31MPG hwy new Beetle for example. Come on now! It's real easy. Put a 1.2 liter turbodiesel like you have in the European Polo and mate it to a strong hybrid drivetrain. Bam. Now you have more MPG than any Prius and decent acceleration due to the power of the electric motor. 55-60MPG HWY is within reach. I know VW can make that 1.2L Diesel pass emissions in the USA so make it happen and beat the competition! 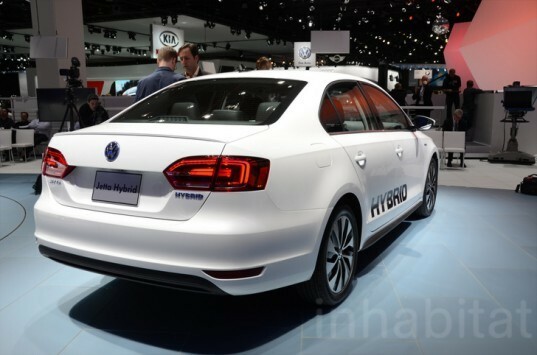 Volkswagen really stepped up their green game at the 2012 NAIAS as this new Jetta makes them one of the very few automakers that offers both clean-diesel and hybrid versions of the same vehicle. The car has a 1.1 kilowatt lithium ion battery mounted in the trunk while a 20 kilowatt (that's 27 horsepower) electric motor sits sandwiched between a 1.4 liter turbocharged gasoline engine and a seven speed manual transmission. Coming to showrooms around the country this fall, the Hybrid Jetta may be one of the hottest eco and pocket friendly electric vehicles this year! With a front-wheel drive, seven-speed dual-clutch automatic transmission, the hybrid Jetta will have an estimated combined gas-mileage rating of 45 mpg, according to Volkswagen. Outside, the car's been outfitted with an updated grille and a rear spoiler that boosts its aerodynamics. Inside, the Jetta comes equipped with an instrument panel that relays hybrid system information. It will also have a "zero emissions" menu in the stereo that shows what percentage of the last minute was spent without using engine emissions. The car's streamlined shape is sure to be a hit with both green and non-green consumers.